As you would imagine, packing up for such along trip is a delicate balance between being sure to take everything you think you will need, no matter how obscure, and being sure not to overload yourself with too much stuff. There is a definite urge as one packs to throw everything in but the kitchen sink. Our problem was compounded by the fact that family and friends, and our own research, gave us conflicting information on what to expect. Some people told us that even the most crucial of necessities (as we Westerners like to call them), such as toilet paper, would be hard to come by, whereas others pointed out that China is a developed country after all, and so horror stories about the lack of personal comfort items are most likely extreme exaggerations. We found ourselves coming to compromises on the packing issue. For example, Nancy wanted to take an extra pair of black dress shoes but Bryan put his foot down (no pun intended) and nixed the idea. Likewise, Nancy strongly urged Bryan to leave behind his 20 pound desktop-sized HotRod Joystick despite the protests of the latter. The end result of our efforts were four large suitcases all packed to the gills, along with several smaller carry-on bags and backpacks. Nancy's packing expertise (you should see her fold shirts down to millimeters in thickness using special folding tricks, it's amazing) allowed us to get everything we thought of as necessities into the aforementioned bags. Each one was just a feather's weight under its respective maximum weight limit. There is something very satisfying about perfectly packed luggage, neat and tidy and ready to go. At 2 a.m. on the morning of our flight, with our luggage lined up neatly at the front door, we fell exhausted into bed. At 6 a.m. we were awoken by our alarm, and dragged ourselves bleary-eyed but excited out of bed. Nancy's parents took us to San Francisco International airport. A few words about the new International terminal are in order here. Simply put, it's a beautiful new terminal, breathtakingly clean and full of energy and excitement. Or at least, that's how it seems to you as you pass through it at 7:30 a.m. on four hours of sleep and with visions of exotic destinations bumping around in your head as you start the most exciting trip of your life. Another noteworthy aspect of our final few hours in the States was the service of ANA (All Nippon Air). We have never before seen an airline counter run so efficiently and courteously. It helps that we were practically the only ones in line, but something about the service provided really seemed a big step above anything we had experienced before. We had been worrying that the amount and weight of luggage we were bringing would be a problem, but they took all of our cases with a smile and didn't even bother to weigh them. When we found out that they had seated us in 42H and 42K, we were a bit concerned - we wanted to sit together and certainly there must be at least one seat between 42H and 42K, right? As it turned out, yes, there was a seat between us (42J), but ANA had been nice enough to block that seat out from the reservations as the flight was not full. This gave us extra room and was a very nice touch. We couldn't imagine an American airline company going through the trouble of blocking out the middle seats for the convenience of its passengers. 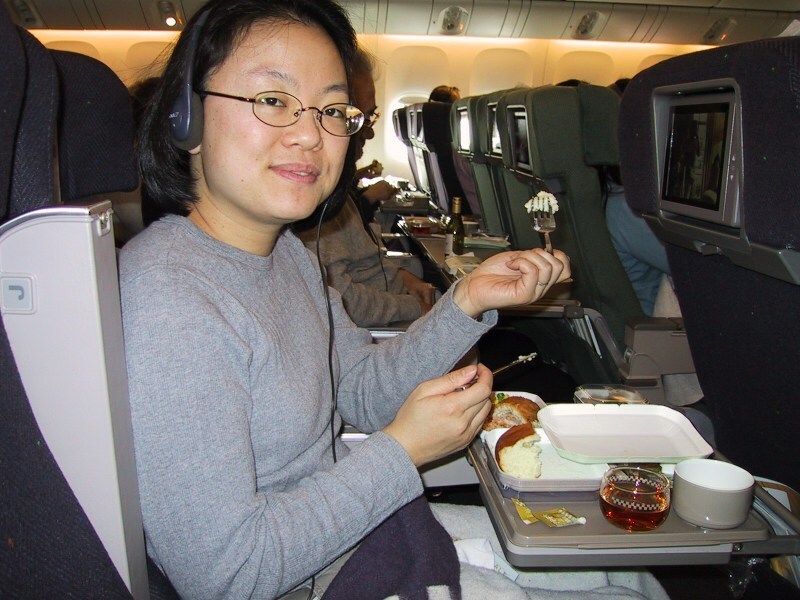 This was just the first taste of what we would soon discover is the superior service of ANA. The takeoff from S.F. was really spectacular; it was a very sunny, clear morning and, being seated on the right side of the plane with a window seat, Bryan was able to get a fantastic view of S.F. with the Golden Gate bridge in clear view, giving way to the brown cliffs of the Pacific coast north of the city. Nancy missed out on this view, unfortunately, having decided that takeoffs are a great time to nap. The coast slid by, and drifted further and further away, until it was only barely visible in the distance, and then finally, it was gone, leaving only pure blue sea and skies in view. We were now further west than we had ever been before! The rest of the 12 hour flight was uneventful. ANA's in-flight amenities are excellent - we each had our own screen for watching one of several movies or playing video games. There were an abundance of stewardesses on board; we found it interesting to note that Japanese airlines (or at least, ANA) still appear to have a hiring policy which has long since been done away with in America - that only women, and pretty ones at that, between the ages of about 20 and 28, are hired to be stewardesses. We're not sure how such hiring practices would go over in the U.S., or more accurately, how long it would take before the airline would be sued into changing its policies, but it doesn't seem to be a problem in Japan. The meals were actually good, being an interesting mix of Japanese and American food, well prepared and tasty.